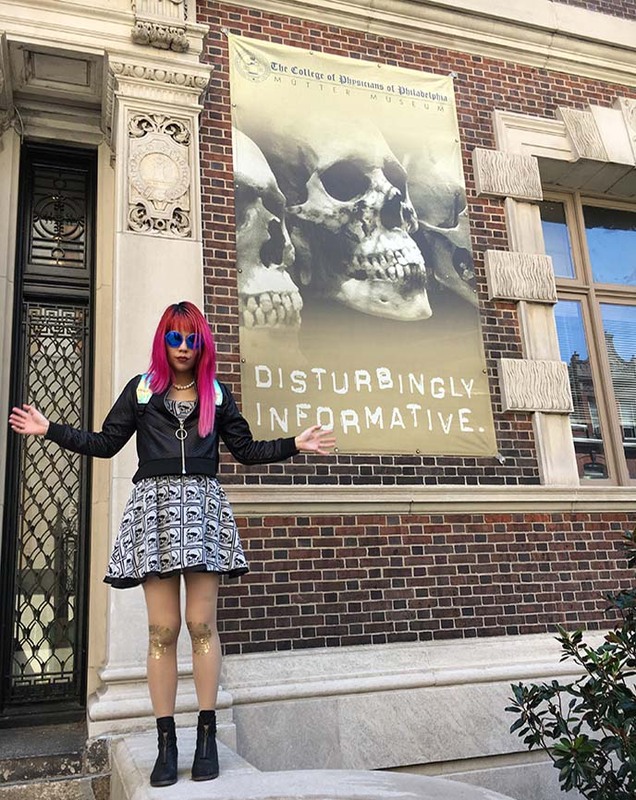 Mutter Museum in Philadelphia review: Gothic skulls & medical curiosities! 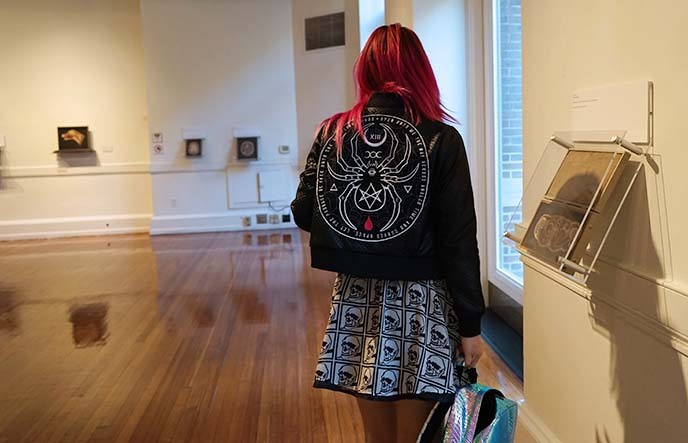 Philly Goth travel guide. 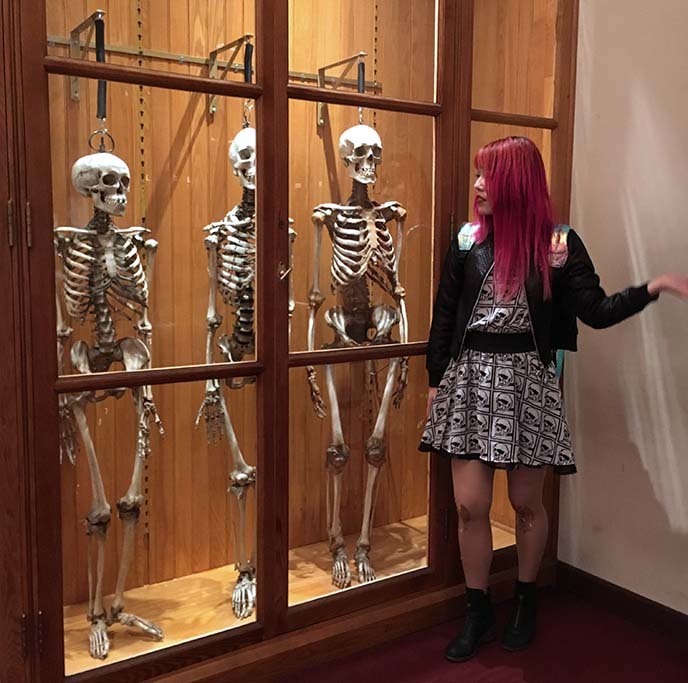 I recently ticked another Gothic destination off the bucket-list: Philadelphia’s Mütter Museum. 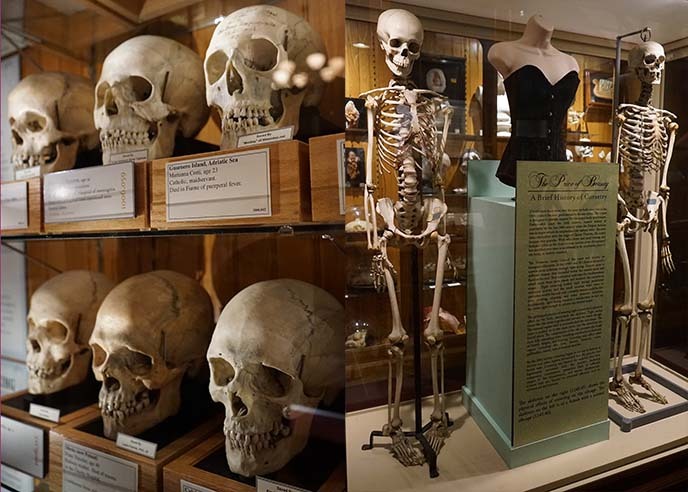 This is one of the world’s most renown medical museums; a mesmerising collection of bodily oddities, pathological specimens, wax models, and unusual skeletons. 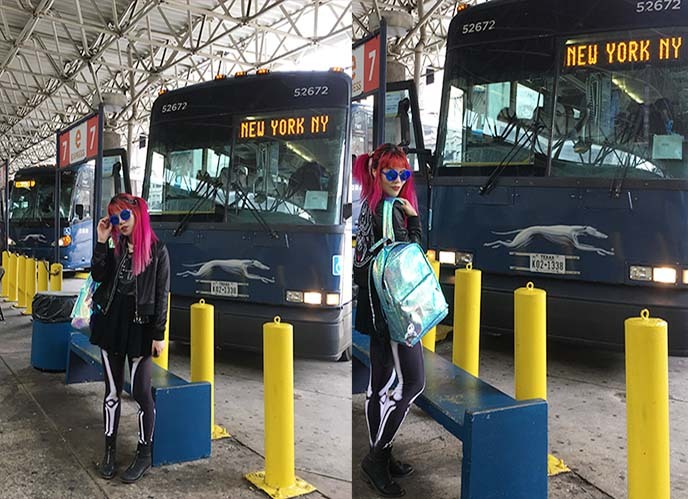 To get to Philly, I traveled from NYC by bus. It was an easy journey thanks to booking website Busbud, which lets you search for bus routes and compare prices/times/info in thousands of cities worldwide. My bus ride was only two hours long, and took me to/from convenient downtown districts (meaning I could avoid long journeys to airports or train stations, and waiting times). Busbud turned out to be an affordable and sustainable way to travel like a local, which I’m all about. 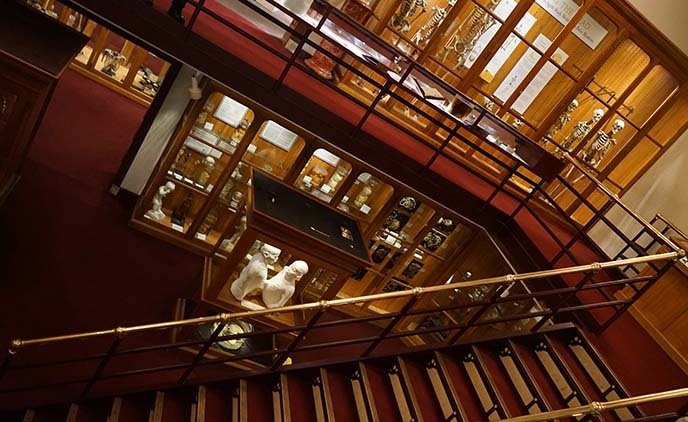 The museum is part of The College of Physicians of Philadelphia, a non-profit institution that promotes both the heritage and future of health and medicine. The College was founded in 1787, is one of the oldest professional medical organizations in America. The man behind the name is Dr. Thomas Dent Mütter. He convinced the College to establish this educational museum, and donated the original collection in 1858. Fun fact: Dr Mütter added the umlaut (ü) to his name after his travels in Europe! On a more serious note, he pioneered many important innovations in surgery. The doctor made significant advances in plastic surgery, insisted on cleanliness in a time before germ theory was recognised, and emphasized pre and post-patient care. 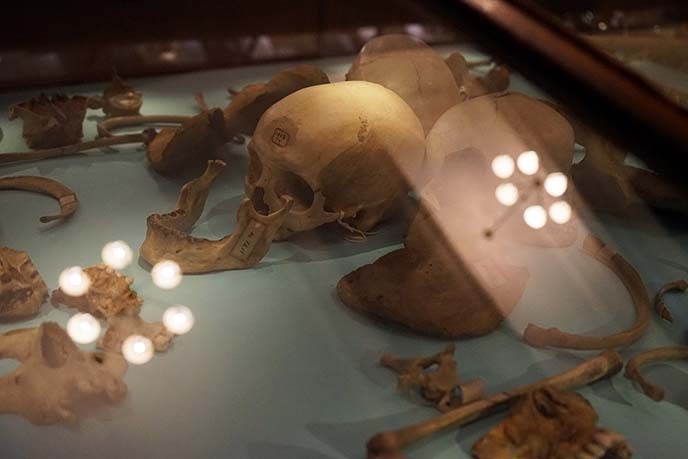 These curiosities include over 3000 osteological specimens, including these “skeletons in the cabinet” and a spinal segment of John Wilkes Booth (the murderer of President Abraham Lincoln). 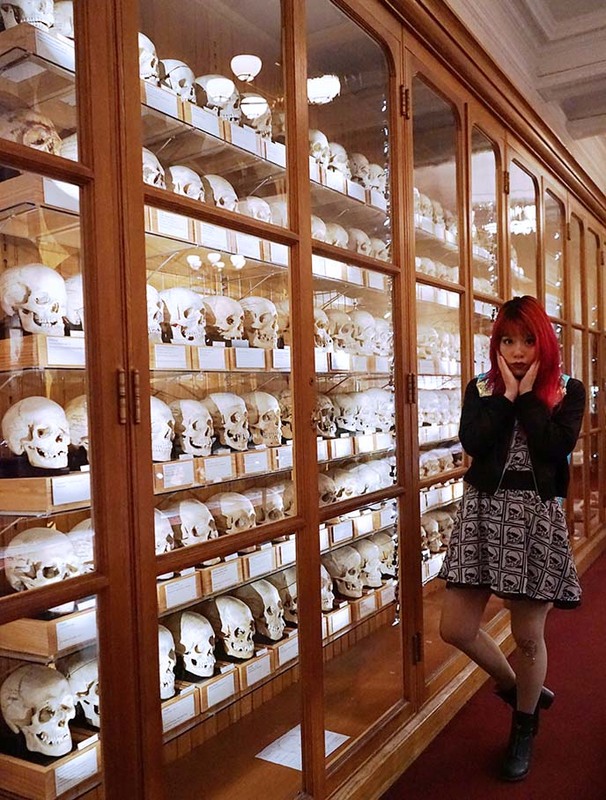 Goths will adore the Hyrtl Skull Collection: there’s an entire wall that displays 139 human skulls! 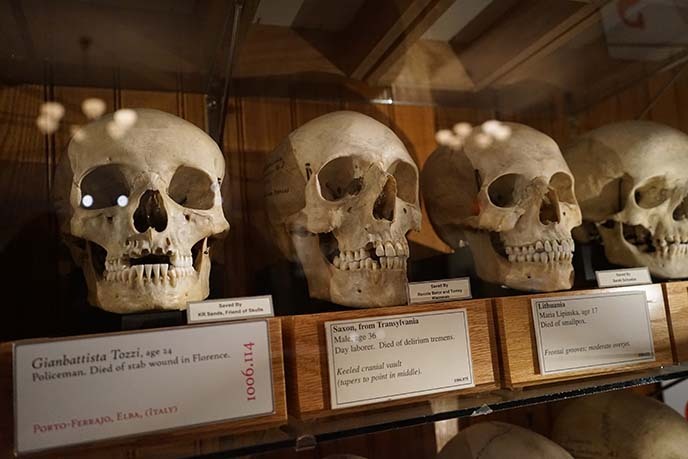 Joseph Hyrtl, a 19th century Austrian anatomist, put together this collection to show the diversity of cranial anatomy among various European groups. Each of the bony rictuses seems to have a different personality. My personal favorite was the jolly-looking toothless skull of Geza Uirmeny, who “lived to 80 without melancholy.” He happens to be from Hungary or Romania, the country of Count Dracula. Many of the skulls are inscribed with comments about the person’s age, place of origin and cause of death. The cards also convey this information (“Saxon, from Transylvania.”) Hyrtl built this collection to show the variations among Caucasians in Europe, in rebuttal to the claims of phrenologists (who believed race and intelligence/personality caused anatomical differences). 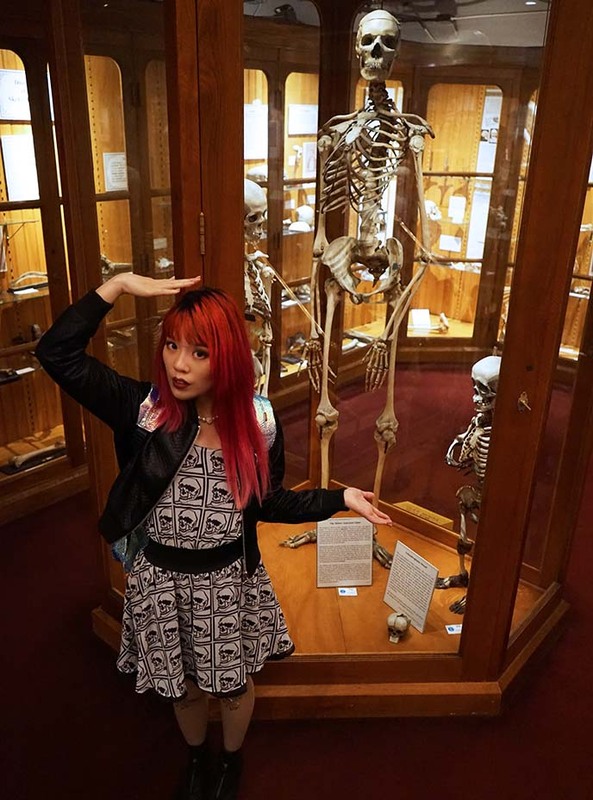 The specimens can be on the morbid side, such as depictions of skin diseases, and preserved fetuses with deformities in jars. 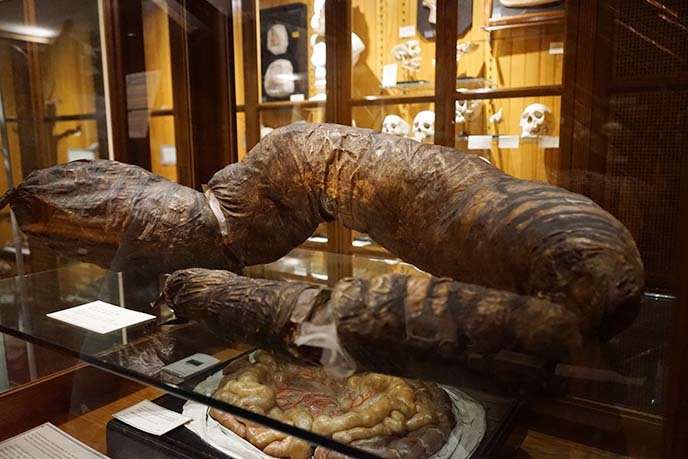 However, I found these displays fascinating, as I love seeing the “beauty in the grotesque.” I’d say the Mutter is the perfect museum for travelers who gravitate to unusual, alternative attractions. I can’t measure up to “The Mütter American Giant,” who looms over me at 7 feet 6 inches and is the tallest human skeleton on exhibit in North America. Quite the size disparity between him and the 3 foot six dwarf skeleton on the right, which belonged to Mary Ashberry. So interesting to see how various illnesses and trauma manifest on the human anatomy. From dental patterns to healed fractures, there’s a lot you can tell from a person’s bones. Not everything is caused by genetics, injury or disease. Some of these “body modifications” are self-inflicted for various reasons, such as for the sake of beauty! On the right, you can see a regular ribcage compared to one that was narrowed by wearing a corset. 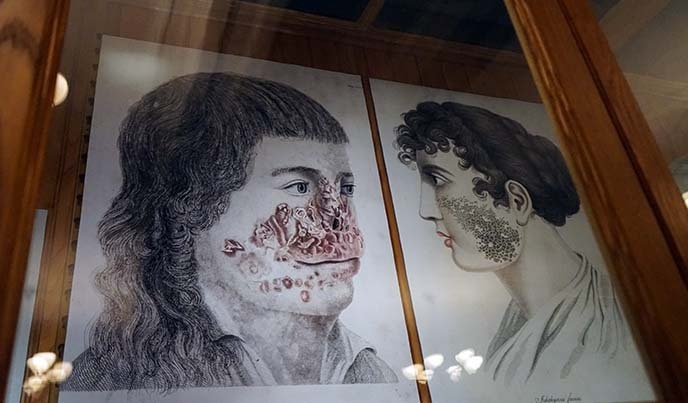 The Mutter Museum also had preserved skin samples that show tattooing from the past. 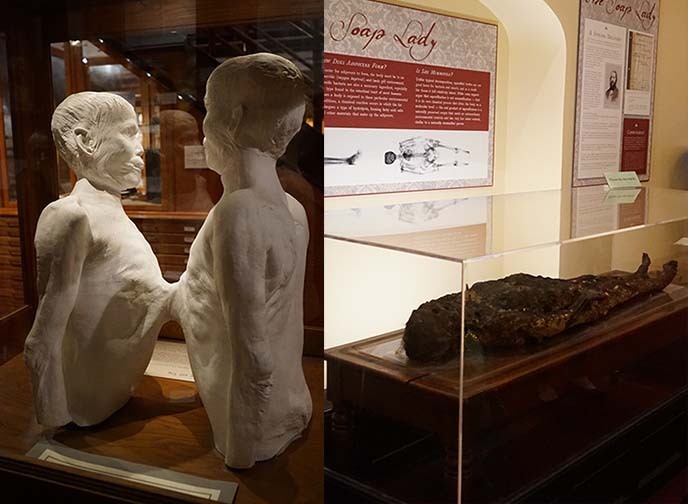 One the museum highlights is a plaster cast of Chang and Eng, conjoined twins who were born in Thailand in 1811 (hence the term “Siamese Twins.”) They came to the US in 1829, and attracted large audiences as touring “freakshow” performers. The twins married sisters who later got into a fight — so the brothers spent three days at one wife’s home, then three days at the other’s! Chang and Eng were joined at the sternum and had a fused liver, which is on display at the Mutter. Chang had a stroke and drank heavily, so his liver was large and deformed. He died after suffering a fall and bronchitis, and his brother followed three hours later. Another famous resident of the Mutter is The Soap Lady, on the right. She’s encased in adipocere, an unusual fatty substance that formed because her burial environment was alkaline, warm, and airless. The museum conveys medical information in different formats: photography, wax moulages, old illustrations, and even an interactive video re-enactment of a Civil War era amputation. Many come to see the articulated skeleton of Harry Raymond Eastlack (left photo). He suffered from fibrodysplasia ossificans progressiva, a rare condition that affects the bone repair process, and slowly turns healthy muscle and tissues into bone. By his mid-20s, his vertebra had fused together, and he was locked in this position. When he died days before his 40th birthday, his body had completely ossified. Behold… the Mega Colon. This gigantic tract belonged to a 29-year-old man who suffered from Hirschsprung’s Disease. The nerve supply to part of his large intestine was damaged, making it extremely difficult to pass waste (he would be constipated for a month or more). As his condition worsened, the abdomen and colon swelled enormously, sadly leading to his death. Upon autopsy, the colon was 8 feet long and contained 40 pounds of feces! The exhibition visuals may be intense for some visitors, but I thought they were engrossing examples of pathology, intersected with history and culture. For example, above is a re-enactment of a prehistoric burial ground. 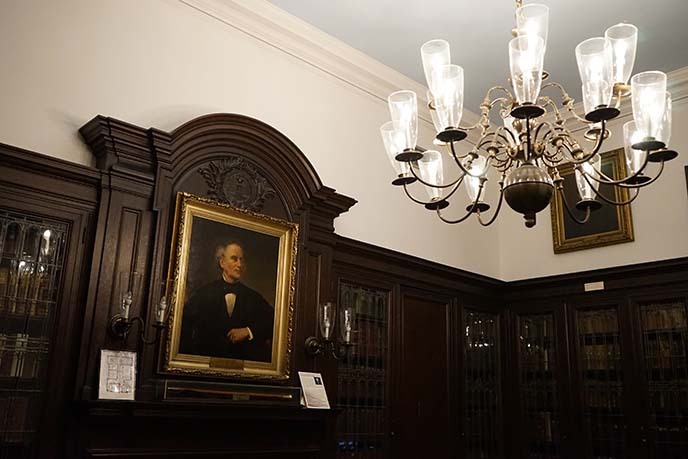 Philly’s College of Physicians is also home to the impressive Historical Medical Library. The shelves hold comprehensive journals from past centuries, and more than 400 incunables (books printed before the year 1500). It’s also possible to rent out the stately halls and rooms, for special events. 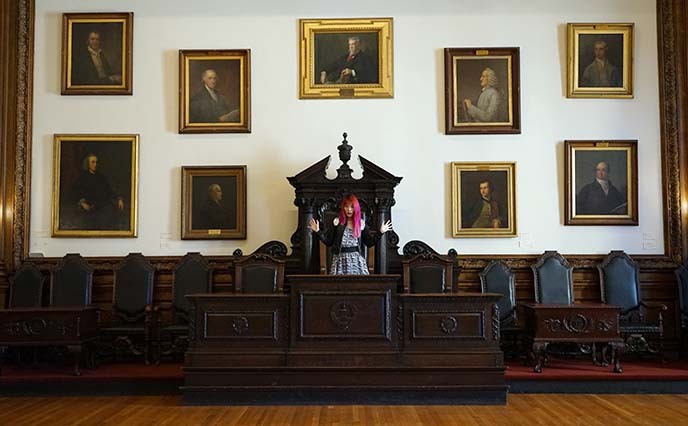 I pretended to be a doctor, giving a powerful speech at this Gothic-looking podium. 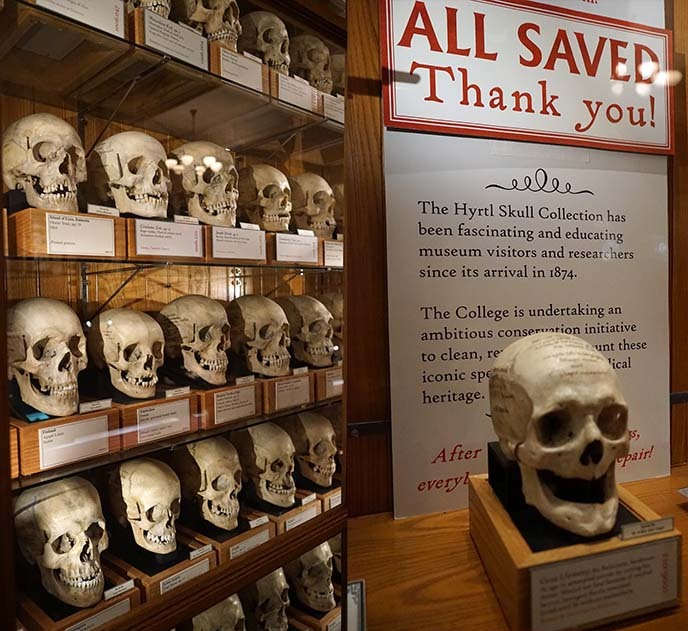 The Mütter also has spaces for rotating exhibits relating to the theme of the museum. I enjoyed Lisa Nilsson’s “Connective Tissue” — contemporary works that use ornate quilled paper to create anatomical cross-sections. In addition, you can come to the museum for special events including talks, film screenings (like “The Cabinet of Dr. Caligari”), and an upcoming Halloween jazz speakeasy ball. This is the Benjamin Rush Medicinal Plant Garden, named after the Philadelphia colonial doctor and signer of the Declaration of Independence. 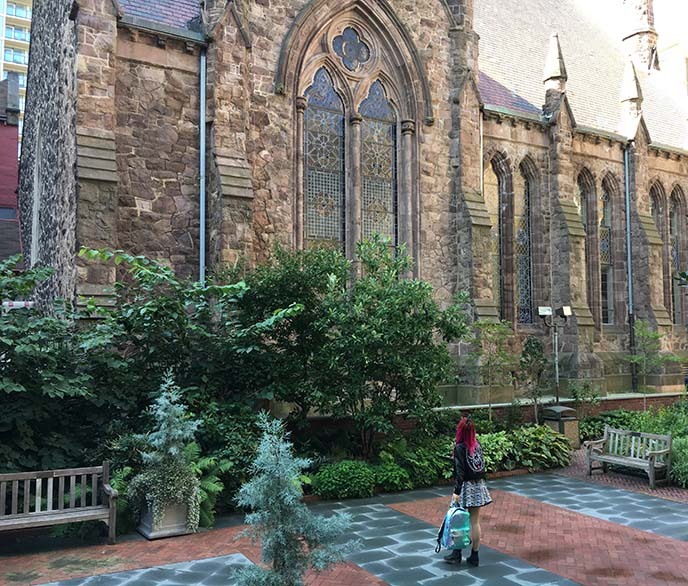 Rush helped found The College of Physicians in 1787, and wanted to establish a medicinal garden for natural healing ingredients. His dream didn’t come to realization until 1937, when the Mutter celebrated its 150th anniversary. 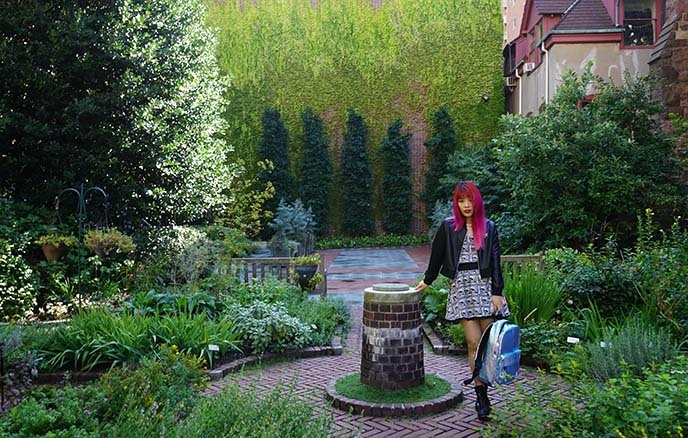 Today, the Rush Garden has more than sixty different kinds of medicinal herbs, which give off a fresh scent as you walk through. Above is a close-up of my Morbid Debutante necklace by Alex Streeter Jewelry. The white shell pearls and skull are the definition of Gothic elegance. 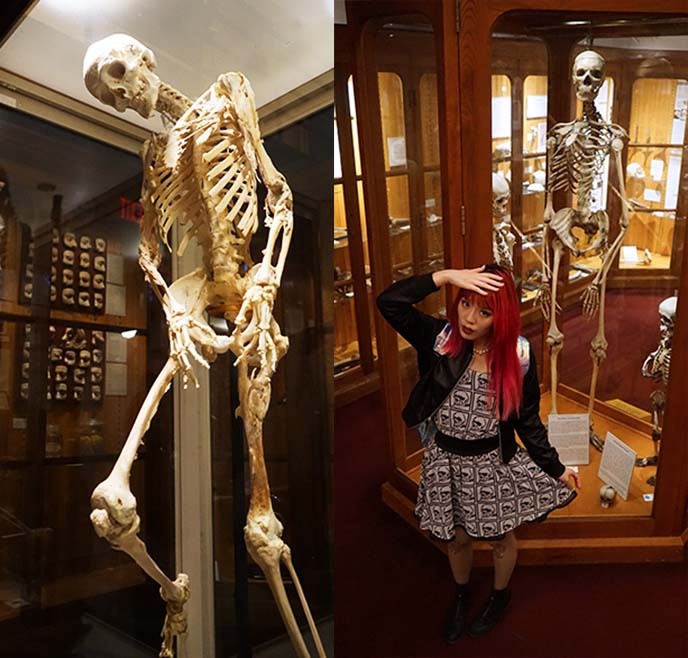 If you are visiting Philadelphia, this is a one-of-a-kind medical museum that can’t be missed. 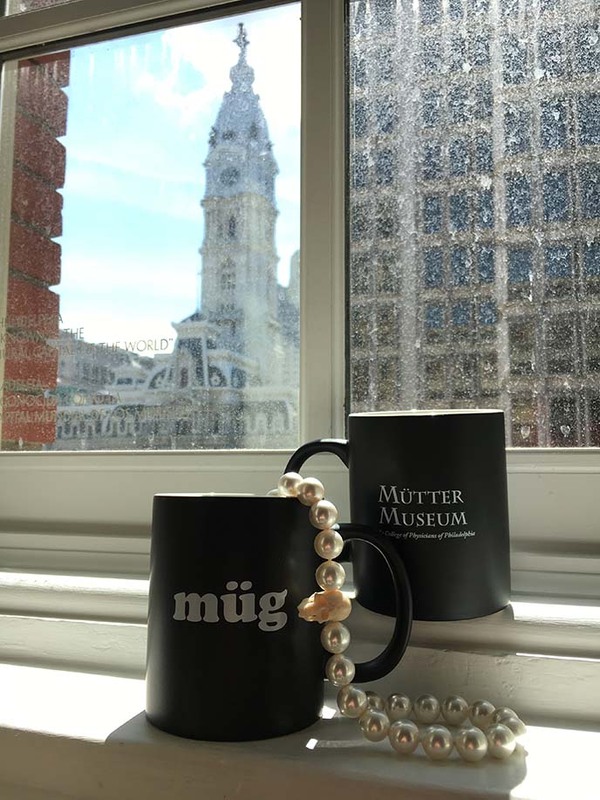 Check out the latest information on the Mütter website including admission fees, tickets, opening hours, special events and more. I’ll end with some bonus Gothic coverage from my Busbud trip. First, a shout-out to the food scene in Philadelphia — everything I ate here was terrific! 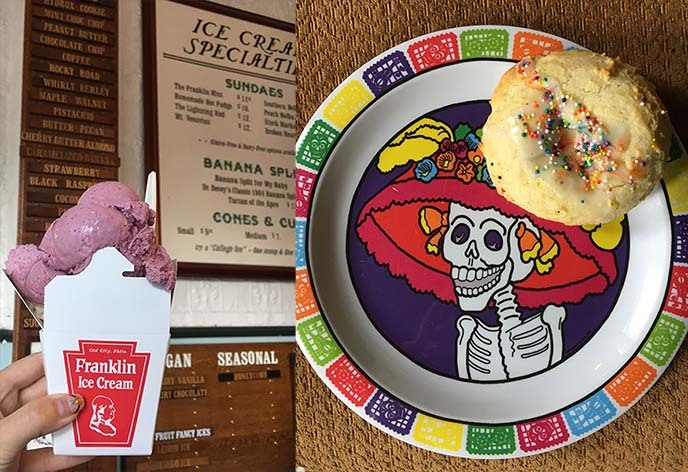 For those with a sweet tooth, I recommend Franklin Ice Cream (I had the black raspberry), and The Bakeshop in Rittenhouse Square (the ricotta scone with rainbow sprinkles is addictive). 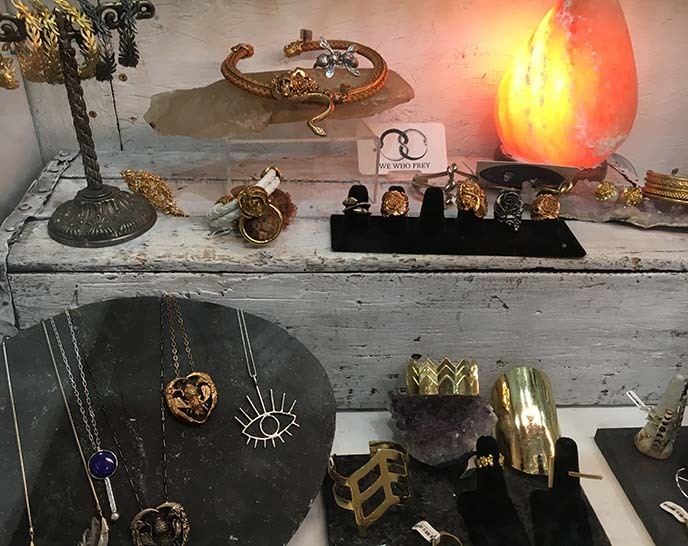 If you’re looking for Goth and alternative shops in the city, there are quite a few choices. 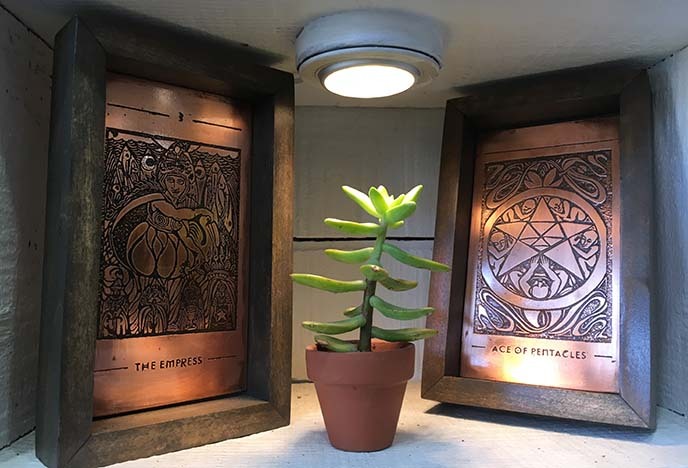 I loved browsing at Ritual Ritual; a boutique filled with occult / nature wonders like tarot card art and plants. 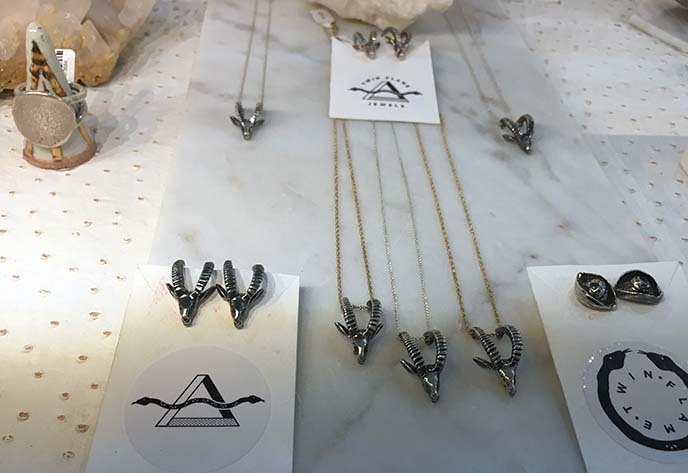 Ritual Ritual has a magnificent selection of artisan, local, handmade jewelry. 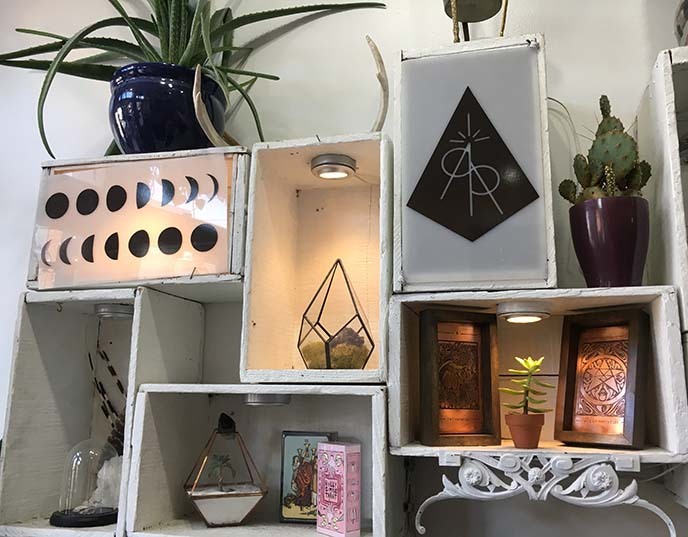 They carry accessories by 60 independent designers from all over the county. … and skull-shaped planters and flasks. 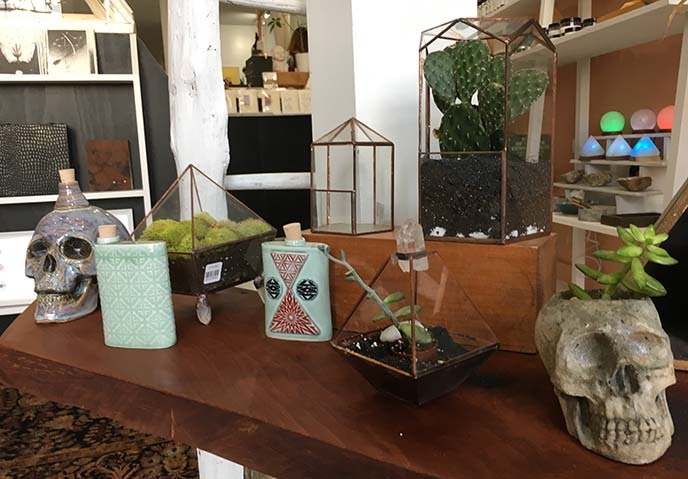 “Rebels & mystics” describes this Philly boutique well. These stories wouldn’t have been possible without Busbud, an innovative website that makes booking bus tickets a breeze. I could see all my routes and options for Philly-NY within seconds — saving me the time and stress of going through multiple bus sites. 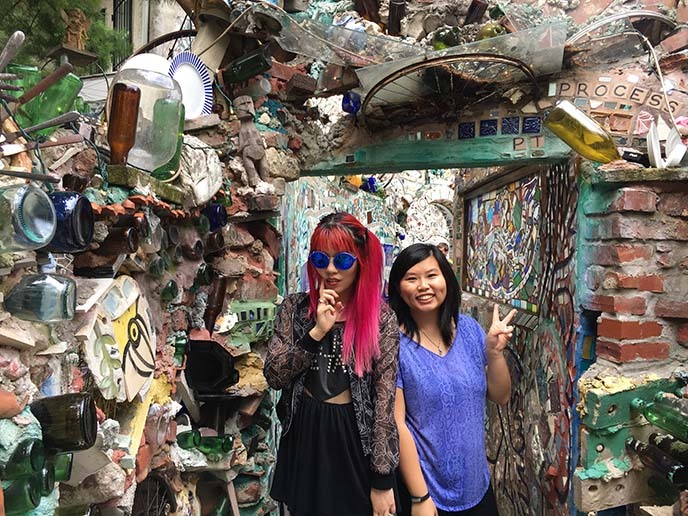 Did you know of these alternative attractions in Philadelphia, Pennsylvania? 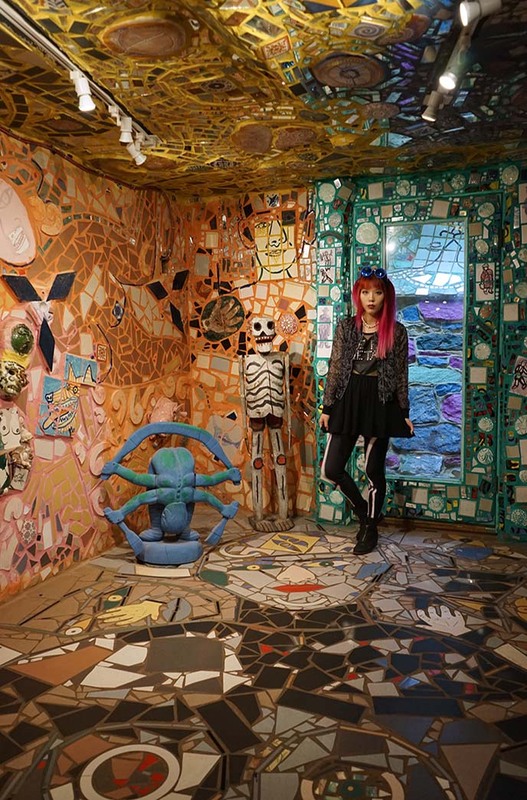 PS, if you missed my first story, check it out: it’s about Philly’s Magic Gardens. 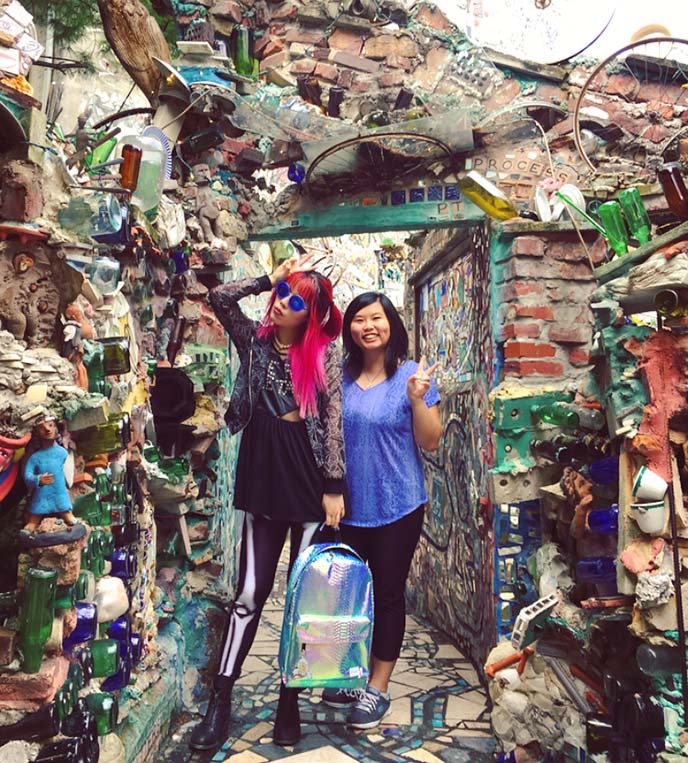 Visiting Philadelphia’s Magic Gardens! 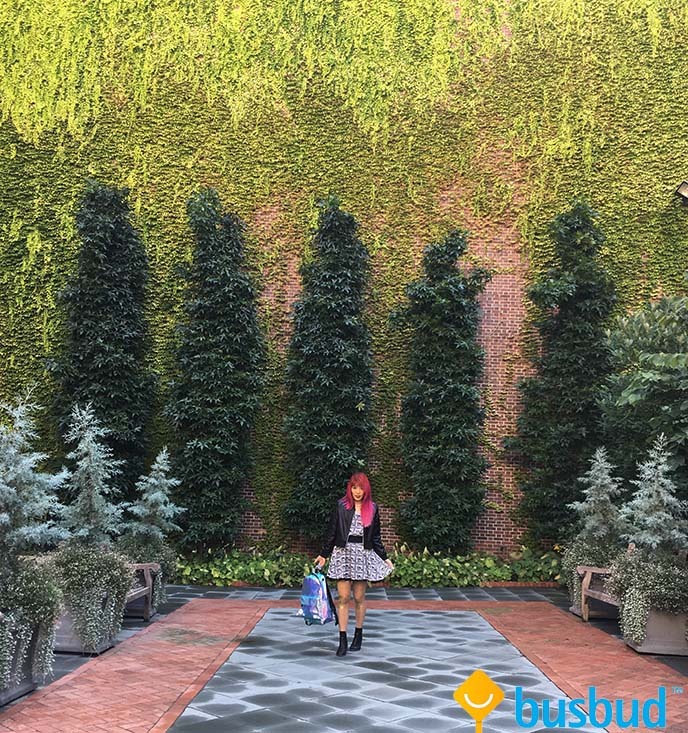 Philly alternative offbeat travel guide, Busbud bus trip review. Coming at you from Philadelphia, Pennsylvania! This artistic, laid-back city is well worth a visit — especially as it’s only a two hour ride from New York. 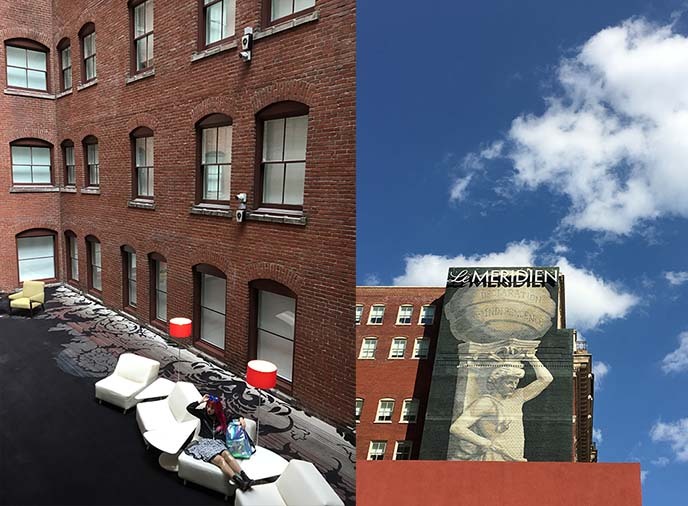 Many tourists come for historic attractions such as the Liberty Bell and Independence Hall… but this isn’t your average travel blog. 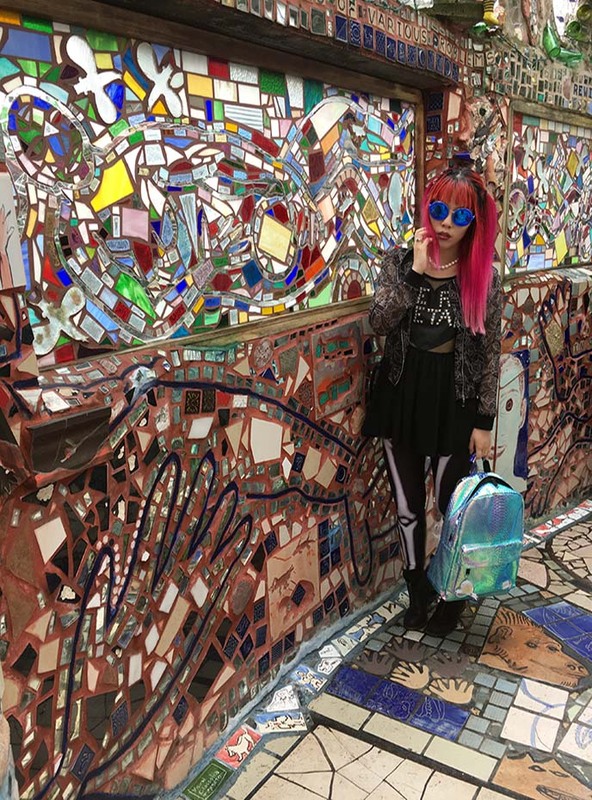 Let’s take a walk on the weird, artsy side of Philly instead, on my weekend getaway with Busbud. I recently was in NYC, and wanted to travel somewhere nearby for Labor Day. 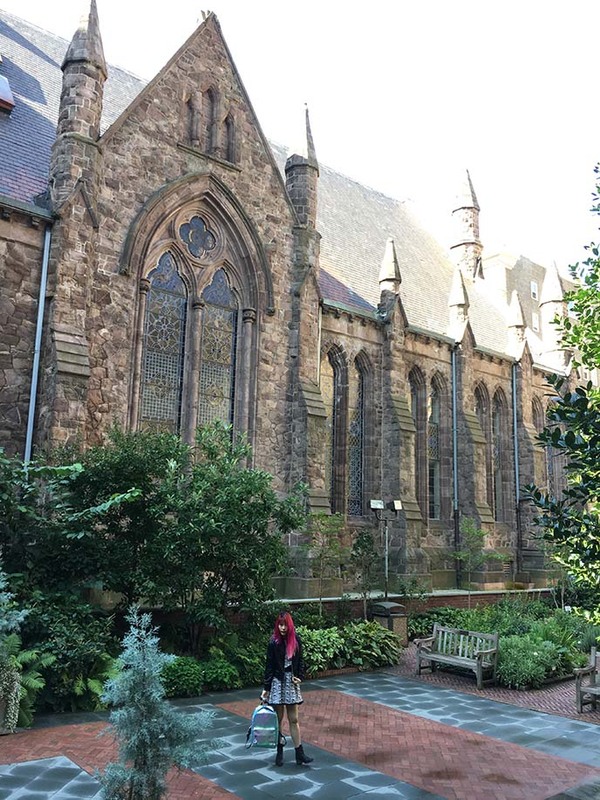 Philadelphia, Pennsylvania was a natural choice: I have good friends here, and love the creative feel of the city. 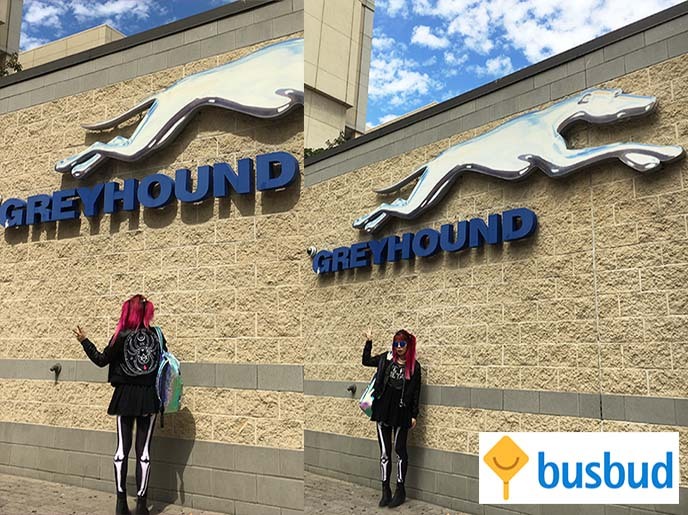 My journey was a breeze, thanks to Busbud — a website that helps you easily find, compare and book bus tickets! Their site lets you search thousands of city-to-city routes all around the world, so you can view the best prices, companies and departure / arrival times immediately on one page. Traveling by bus turned out to be enjoyable: I boarded on time, settled into a comfortable seat, and had free WiFi for the two-hour ride. Bus travel is a great option if you’re on a budget, and it’s a more sustainable mode of transportation. 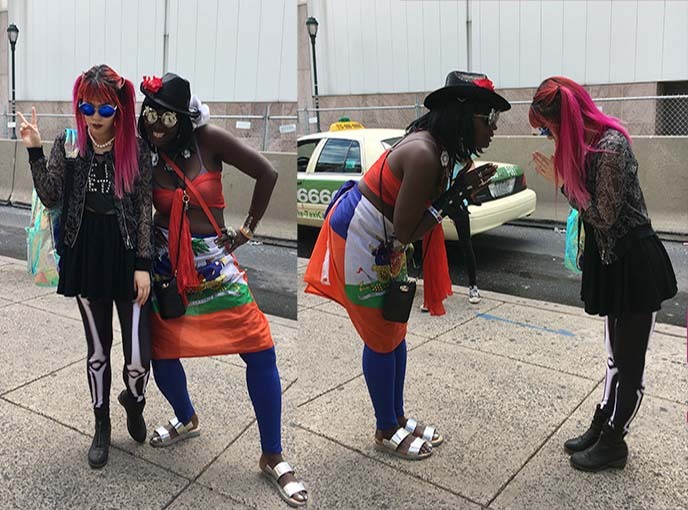 I even made a fabulous new friend along the way: this lady and I connected over fashion, and she insisted on posing Japanese-style with me for photos! Busbud’s cross-platform website and app let you search all the major bus lines, in your local language and currency. They cover routes in 16,000+ cities across over 60 countries… I’ll be using them again for sure, on my next journeys worldwide. 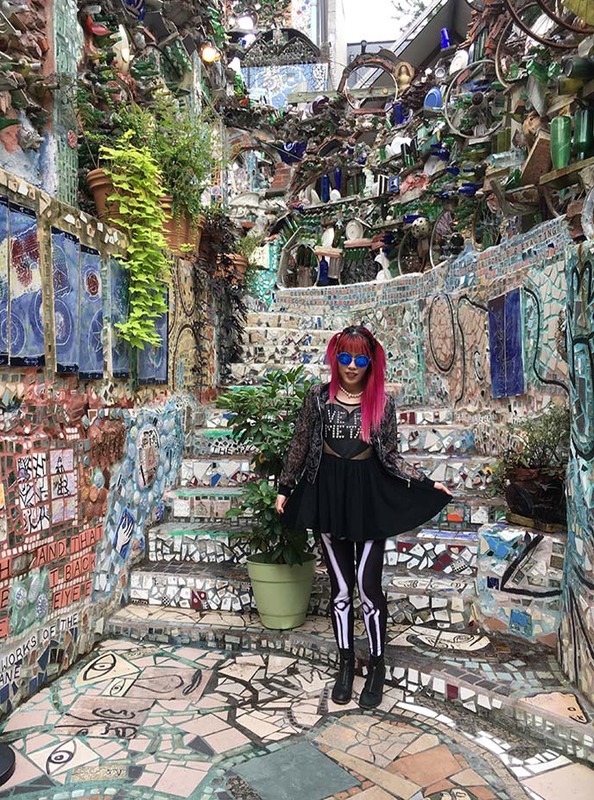 I’m sure you will be keen to visit Philly too… once you glimpse the mesmerizing Magic Gardens! I’m posing in front of the staircase, a favorite photo spot for Instagrammers. Outfit Details: I wore some old favorites from my wardrobe. 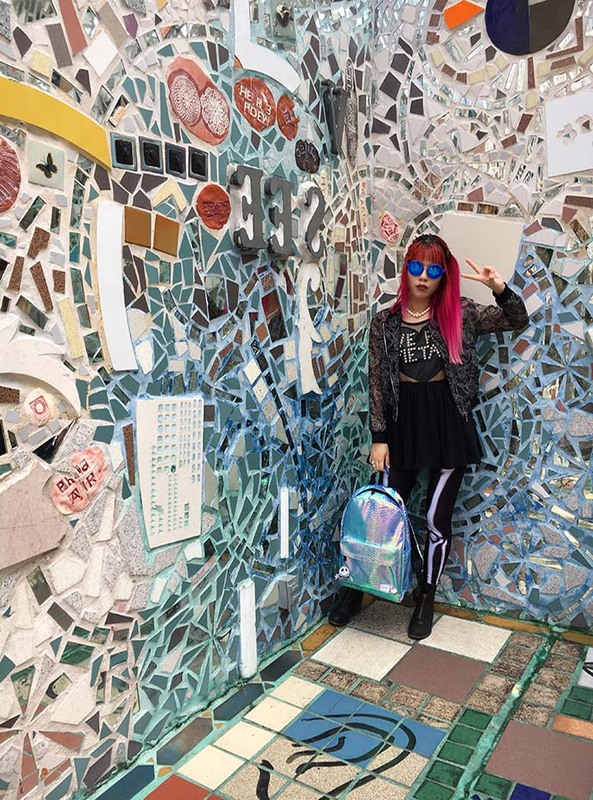 A Gladnews “Very Metal” dress from Japan, a Sailor Moon collaboration jacket from Hong Kong, and Linda Farrow x 3.1 Philip Lim sunglasses that I’m now selling on my Depop (email me if you want them, or anything else in my store). My skeleton leggings are Pamela Mann, from UK Tights. I’ve been a fan of their online store for years: they have a huge selection of stockings, socks and leggings, including many Gothic and kawaii styles. 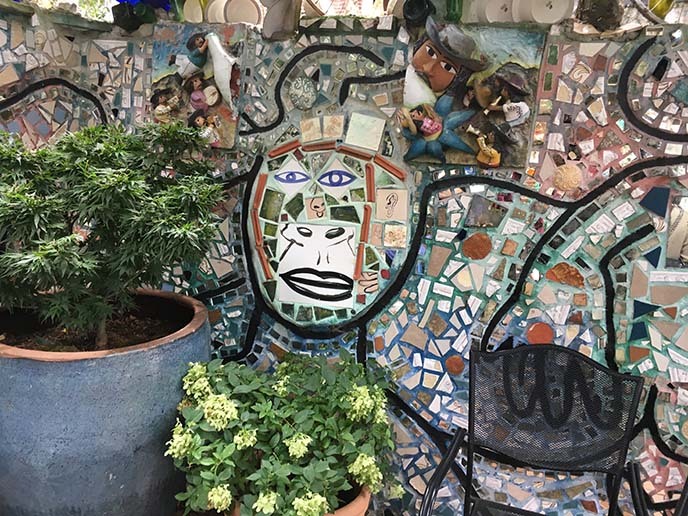 These whimsical mosiacs stem from the imagination of local folk artist, Isaiah Zagar. 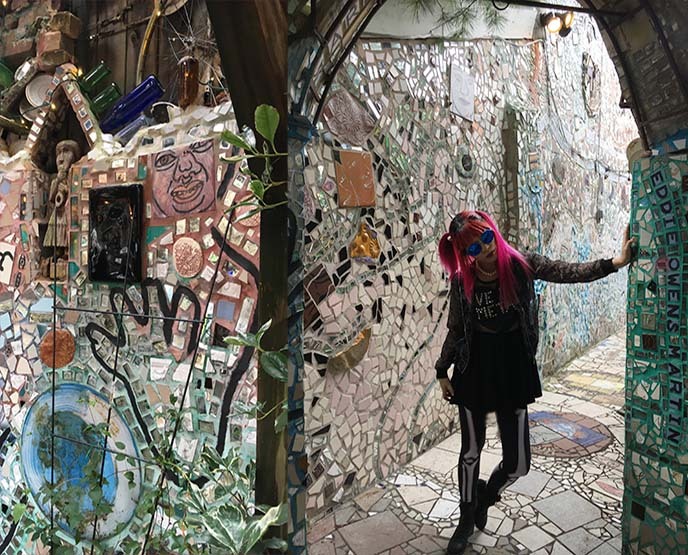 Located at 1020 South Street, Philadelphia’s Magic Gardens currently fill three city lots, including indoor galleries and a large outdoor labyrinth. It was a joy to wander through these colorful tunnels with my cousin and photographer, Ashley Yuen. 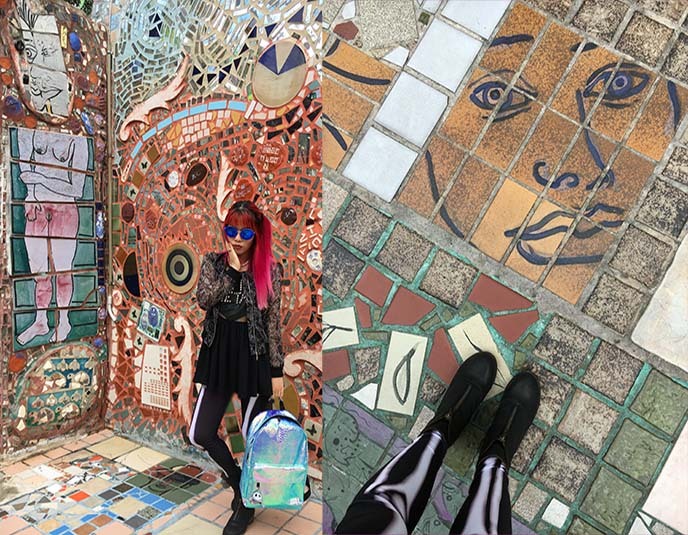 We passed by objects that made us smile (such as Japanese dolls), and took selfies using the shards of mirror embedded in the tiles. Access and tickets: I recommend that you buy timed-entry tickets to The Magic Gardens in advance, from their site. The venue is growing more popular each year, and passes are often sold out or require hours of waiting before an available time slot. Hint: there are student and group discounts available. Once you walk in, be prepared for this eye-popping sight! Isaiah Zagar’s 3D art surrounds you from all directions. The mosaics made up of seemingly haphazard objects (kitchen tiles, glass bottles, bicycle wheels, china plates) — yet the colors and arrangements come together harmoniously. He was inspired by Latin-American art, and makes references to other visionary creators within the work. Look closer, and you’ll see visual references to the artist’s life, family, community and passions. In the photo above, you can also glimpse mysterious words integrated into the found art. 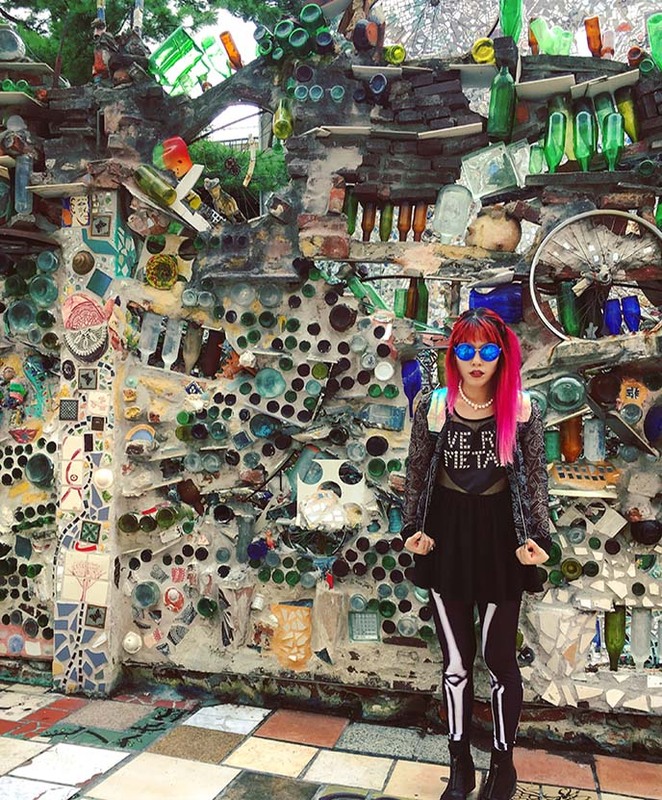 What inspired Isaiah Zagar to create this garden of delights? The story begins in the 1960s, when he moved to the South Street area with his wife, Julia. The couple dedicated themselves to revitalizing this derelict area, by creating beautiful mosaics on neighborhood walls. He developed an imaginative style — constructed almost entirely from found and recycled objects. Zagar literally used every inch of his environment. Don’t forget to look down, or else you’ll miss the quirky details on the floor. In 1994, Zagar started beautifying the vacant lots located near his studio. 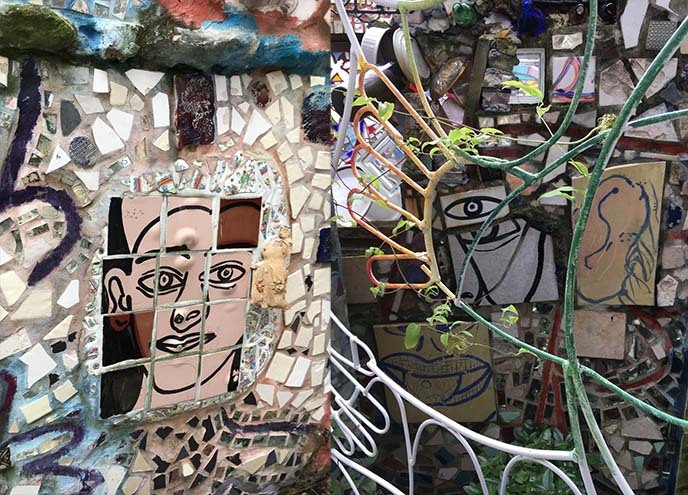 The sculptures grew, and the area expanded… becoming the Philly Magic Gardens as we know them today. Ashley and I spent over an hour here, exploring the various tunnels and grottoes, and taking in the uplifting details. 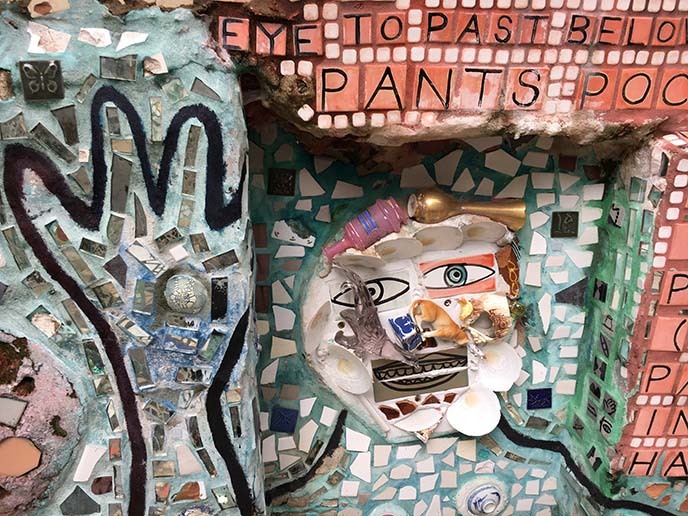 In 2008, Philadelphia’s Magic Gardens opened up to the public. 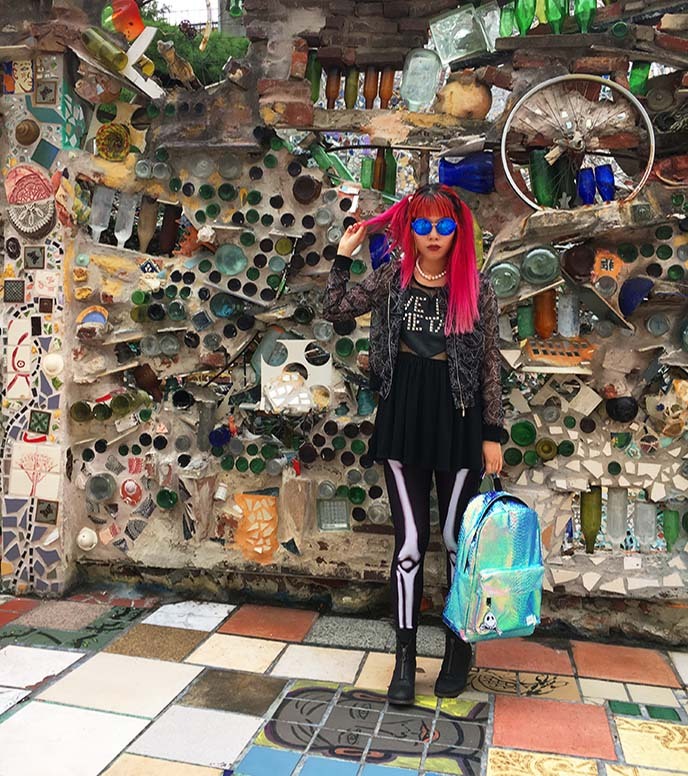 The non-profit organization aims to preserve Zagar’s artwork in this district, and educate visitors with tours, interactive workshops, concerts, exhibitions and other community events. These photos show only a fraction of the 3000 square feet space. There’s also an indoor gallery space, which hosts international artists and puts the spotlight on fringe / outsider art. “99 bottles of beer on the wall….” So much detail and color in a single shot. 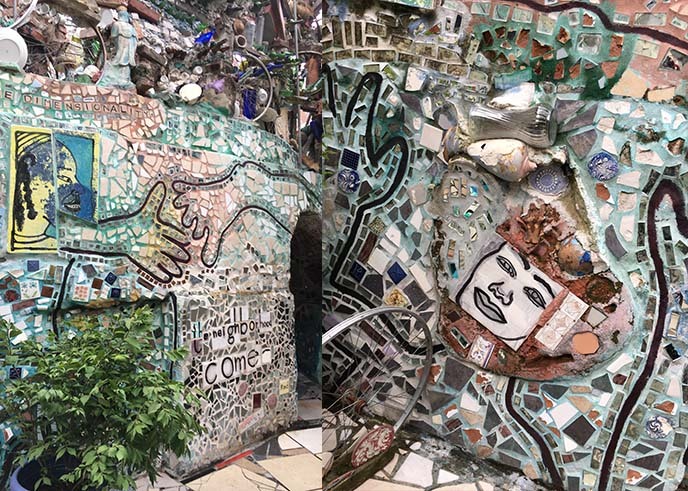 To this day, Isaiah Zagar continues to create mosaic murals that brighten up the streets of Philadelphia. 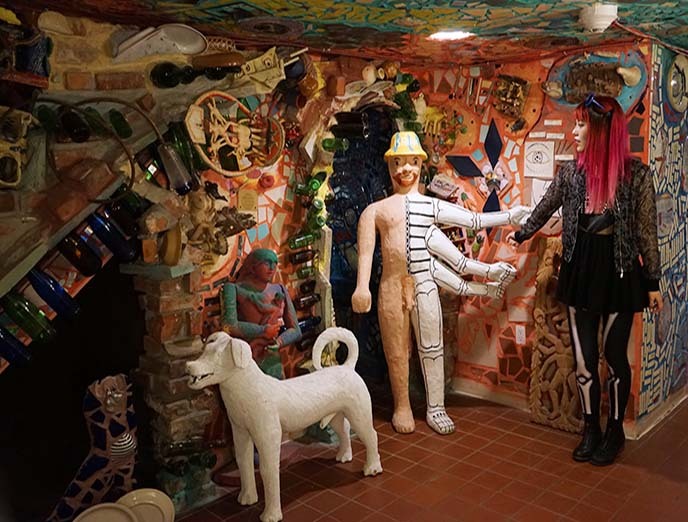 The Magic Gardens has a basement level as well, which is only open to visitors during guided tours. Some of the artist’s larger works live down here, including a cheerful skeleton. I’m all about unconventional, outsider and folk art — especially if it veers towards the weird side. Zagar’s playful and surreal visions were right up my alley. 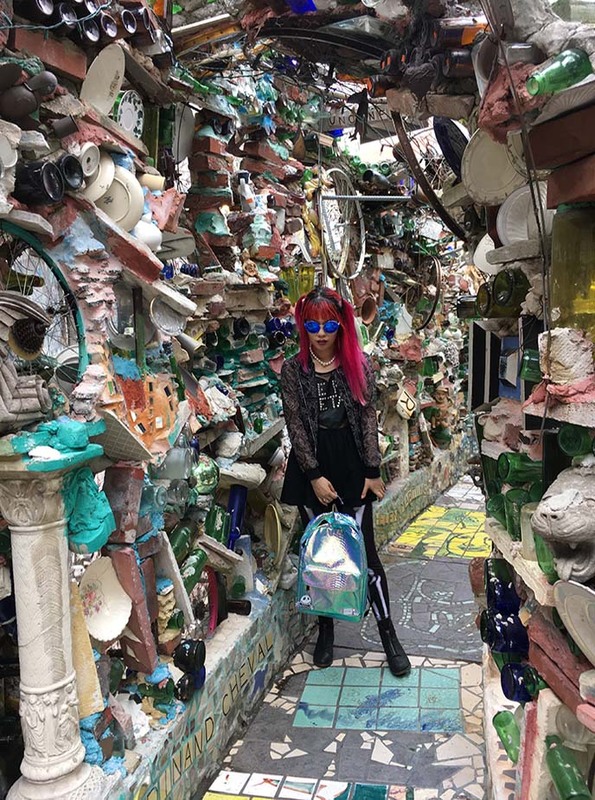 I hope you’ll take a trip to Philadelphia Magic Gardens, and see these fantastic mural masterpieces for yourself. After our visit, we walked back to our hotel, Le Meridien Philadelphia. I’ve stayed with Le Méridien many times (including in Cambodia and Taiwan), as I love the modern design and ever-cheerful staff. We had a comfortable room decorated in mod black, white and red. The staff delivered champagne and fresh fruit plates to our room, which we immediately devoured. How cool is this view from our window? 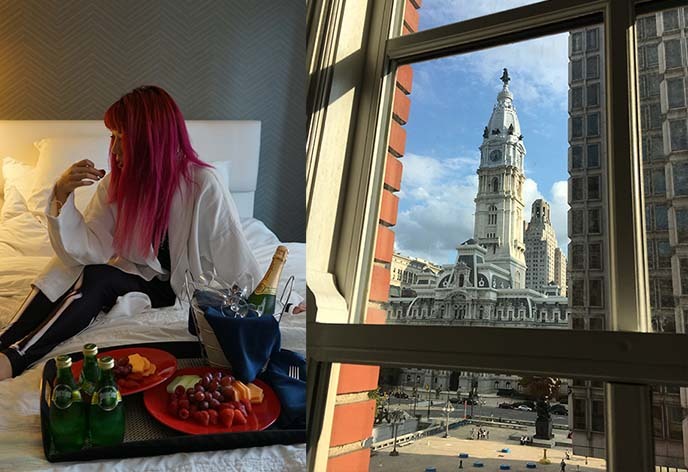 Le Meridien is located right in front of Philadelphia City Hall, built in 1901 and topped with a bronze statue of William Penn (founder of the “Province of Pennsylvania”). The French-chic style extended to the lobby, featuring sleek metallic furniture, wood panel walls and a tiered chandelier. 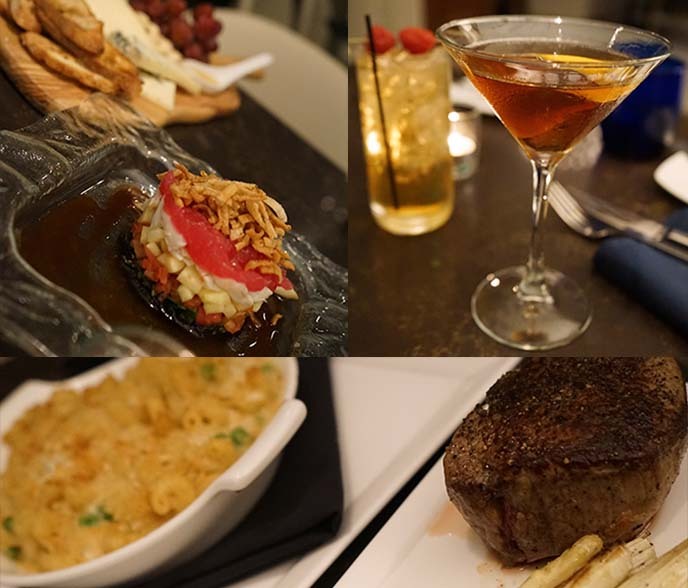 We had a spectacular dinner at Amuse, the classic French brasserie located in the lobby. The cocktail menu included hand-crafted creations named after female muses, such as Brigitte Bardot and Edie Sedgewick. 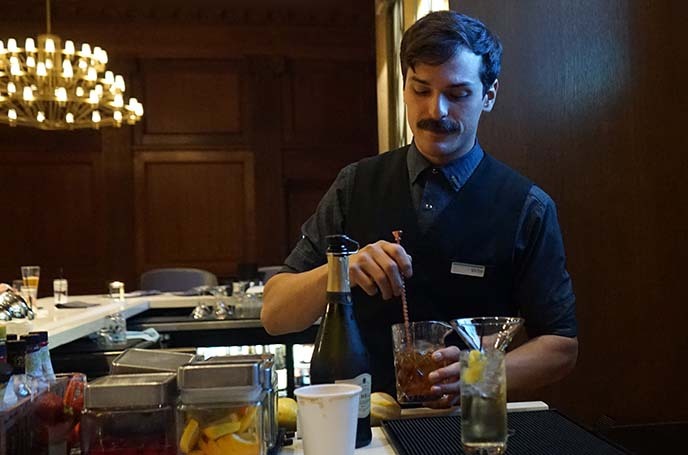 Our mixologist, Victor, prepared some of the best cocktails I had in the city — including custom creations that perfectly matched my palate. We had a hard time choosing from Amuse Restaurant’s menu, filled with French classics like onion soup gratinee and steak frites. After a surprise amuse bouche (raw tuna on a crisp wonton cracker), we feasted on a cheese plate and tuna and crab tower. Next came filet mignon, perfectly braised with sides of asparagus and decadent macaroni and cheese. We ended with a trio of desserts (including apple tarte tartin and chocolate warm molten cake), and I had a Vieux Carre absinthe distilled in Pennsylvania. Our meal at Amuse was sensational, and the service was impeccable — bravo. 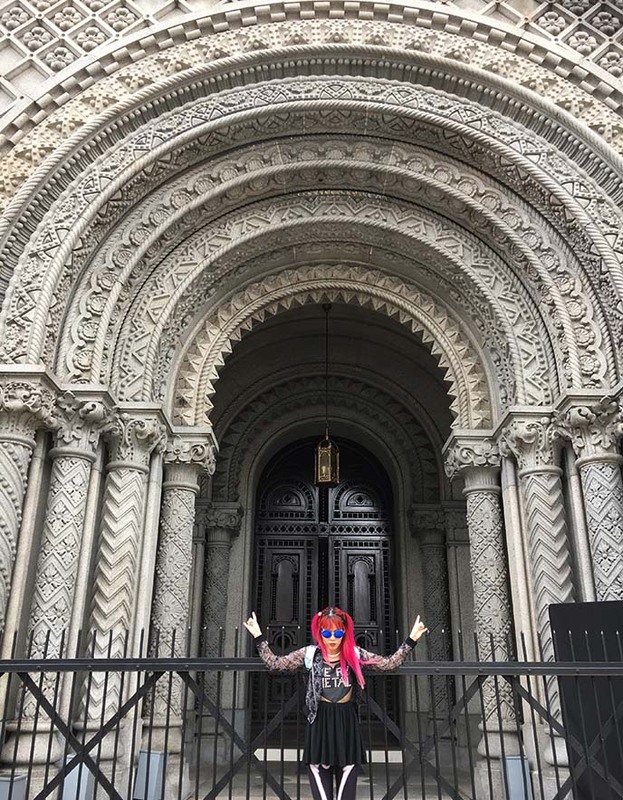 I leave you with a spooky pose outside the Masonic Temple of Philadelphia, which is steps from the hotel. It’s one of the most elaborate Masonic lodges in the US… I can only imagine what rituals take place inside. Did you enjoy Part 1 of my journey in Philly? Cheers to Busbud for making my bus trip a seamless experience, thanks to their easy and informative booking system. 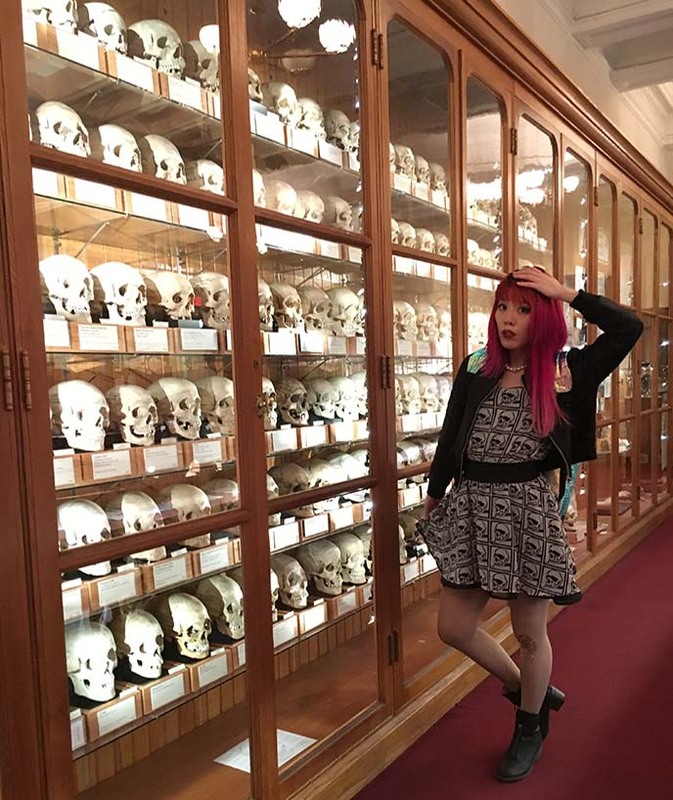 Coming up next, I got an exclusive look inside the Mutter Museum… you’re going to love this treasure trove of medical oddities!